As a way to reward our loyal customer base you can now collect Loyalty Points for every order you place online with us. You get 5 points for every pound you spend. 100 points = £1.00 to use against future orders. Please note: these can only be collected if your order is placed via our website (not telephone orders). You can use your Loyalty Points to get a discount on any future orders which have a value of over £10. Simply log in to your account and your points will be added to your order after checkout. Don't worry if you don't have an account, you can create one when you place your order and your points will still be added to your new account. To spend your points simply log in before you reach the basket page. Once you have done this you will have the option to use your points to reduce your order total, provided you have over 100 points. Where else can I use my points? 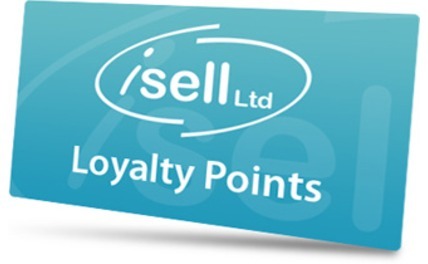 You can collect & spend your points across the whole Isell Ltd family of websites. Just make sure you use the same log in details on our other websites.